Brilliant! Thanks, Ben. Couldn't get it to download, tho'. Suggestions? Trees contribute to their environment by providing oxygen, improving air quality, climate amelioration, conserving water, preserving soil, and supporting wildlife. During the process of photosynthesis, trees take in carbon dioxide and produce the oxygen we breathe. According to the U.S. Department of Agriculture, "One acre of forest absorbs six tons of carbon dioxide and puts out four tons of oxygen. This is enough to meet the annual needs of 18 people." Trees, shrubs and turf also filter air by removing dust and absorbing other pollutants like carbon monoxide, sulfur dioxide and nitrogen dioxide. After trees intercept unhealthy particles, rain washes them to the ground. Great+shared--thx Ben..we need all the trees we could get. Thoroughly enjoyed your collection of pics!! Great photos Ben. Anxious to check out your other albums. Great! I just plant 10 trees. Thanks Ben! Right on! We can NEVER plant too many trees!!! However, I would really like to know WHERE those trees are planted of course! What if a million members would Care2...??? You just helped plant a tree! Way to go! Keep searching with Ecosia to plant even more. and agree with you, Ben: "We can NEVER plant too many trees!!! " 29,8 million Care2 members have planted 383,890 trees so far. Trees for the Future.org planted 17 million trees in 2014. Now we're talking! Now we are 30 million members. What if ONE million would Care2 make a difference...??? You cannot currently send a star to Ben because you have done so within the last hour. Don't be sorry, Dimitris. Together we've planted 2,3 million trees! And today; 3 million trees planted! Now imagine; -If a million members would Care2 plant a tree every day...WOW!!! 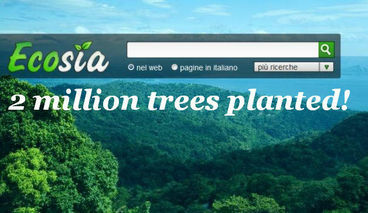 4 million trees planted...now we're talking! Plant more trees! Plant more trees! We can NEVER plant too many! And now...26 million trees planted! And, now...30 million trees planted! 32,3 million trees planted! How about that...? Average UK household produces 10 MT of CO2 per year. PETITION! Stop Queensland Dumping 1 Million Tonnes of Sludge Into the Great Barrier Reef!! !